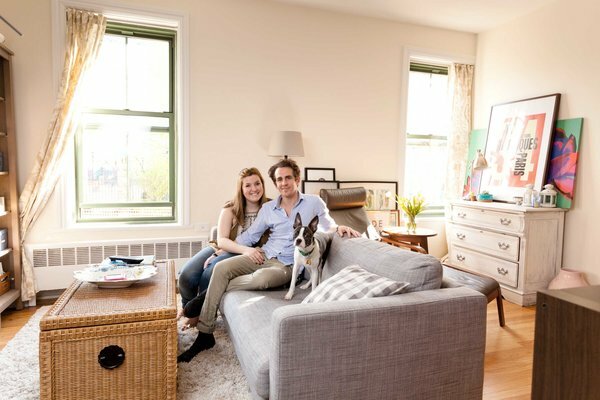 Five years ago, Eric Kabakoff and Christina Lewandowski bought a one-bedroom in a new condominium in Gowanus, Brooklyn, with the idea of moving to a two-bedroom in the same building after a while. But two years ago, when they were outbid on two apartments there, the couple realized their $750,000 budget was not going to be enough. Widening their search, the couple were pleasantly surprised to find prices within their reach in an area of New York they had not initially considered: Manhattan. Brooklyn real estate prices have become so high that parts of Manhattan are starting to look like bargains. The median sales price in Brooklyn hit a record $610,894 in the first quarter of this year, marking the first time the median crossed the $600,000 threshold in the borough, according to a report prepared by the appraiser Jonathan J. Miller for the brokerage firm Douglas Elliman. That is still less expensive overall than Manhattan, where the median sales price was $970,000 for the same period, but apartments in certain Manhattan neighborhoods can be had for less. The best deals can be found along Manhattan’s edges, in areas like Washington Heights, Inwood and Morningside Heights. In these northerly neighborhoods, the median sales price for co-ops and condos in the first quarter was less than $500,000. And as some buyers have discovered, Manhattan neighborhoods where the median sales price is more than $1 million, such as the financial district and Sutton Place, can be less expensive than Dumbo and Vinegar Hill, sought-after Brooklyn areas where the median sales price is $1,275,000. And forget about the quintessential brownstone in decent condition in northern Brooklyn unless you are prepared to shell out around $2 million. Competition from deep-pocketed investors, combined with a scarcity of listings, means even people whose Brooklyn apartments have appreciated in price are having a difficult time finding something nearby they can afford, especially if they’re looking for more space. Rachel and Scott Fein knew it was time to move when their son’s baby gear began overtaking their tiny two-bedroom in Boerum Hill, Brooklyn. So last year, with the help of Elizabeth Helene O’Neill, an associate broker at Warburg Realty, they began searching in earnest. Elena Garcia Diaz-Pines and Sean O’Connell in their recently rented home on the Upper East Side. Their former home was in Bushwick, Brooklyn. Going deeper into Brooklyn required trade-offs they weren’t willing to make, like contending with a longer commute or disappointing schools, said Ms. Fein, who grew up on the Upper West Side. So the couple turned to Upper Manhattan. “We just thought we could get so much more for our money,” she said. In Hudson Heights, they found a 1,400-square-foot co-op with two bedrooms, two baths, an eat-in kitchen and a dining room listed for $899,000. They moved in last month. Though not a three-bedroom, the place is almost double the size of the Boerum Hill apartment. While their new environs lack the variety of restaurants and boutiques they enjoyed in their old neighborhood, the couple like the family-oriented vibe, the proximity of Fort Tryon Park and the many prewar apartment buildings. Buyers who are willing to do some renovating or give up some amenities are finding they can afford a Manhattan address a bit more to the south. 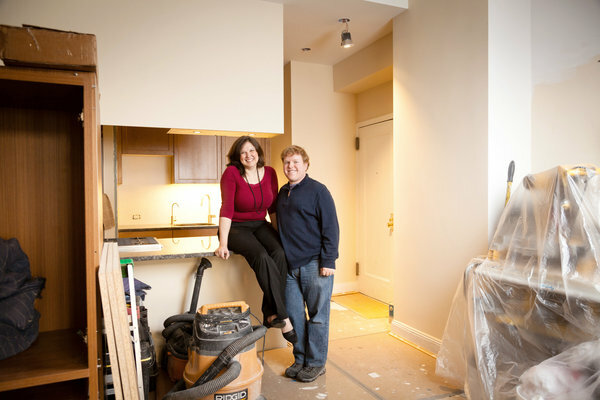 The Carnegie Hill two-bedroom that Mr. Kabakoff, 39, and Ms. Lewandowski, 45, bought needed a new kitchen, wood floors and the removal of layer upon layer of old paint. But after crunching the numbers, the couple realized they could afford the work. Plenty of people, however, would rather head deeper into Brooklyn than consider a move to Manhattan. Others are discovering the qualities that initially drew them to Brooklyn persist in Manhattan’s sleepier precincts, possibly at better prices. Eight years ago, in search of a peaceful neighborhood, Cornelia Adams found an $810,000 two-bedroom loft in Dumbo, which hugs the waterfront between the Brooklyn and Manhattan Bridges. But in the time she has lived there, Dumbo’s popularity has exploded. Its waterfront park is now a tourist magnet. Camera-toting visitors flood its Belgian-block streets. And construction noise is a constant headache as buildings go up. “It became a circus,” Ms. Adams said. Last summer she listed the apartment for $1.025 million with Robin Goldberg, a saleswoman at Halstead Property. It sold in a matter of weeks. But finding a new place wasn’t that easy. After a fruitless “boroughwide search,” Ms. Goldberg suggested she consider Manhattan. Ms. Adams was hesitant, not knowing “if I can afford it,” she said. Ultimately, she made money on the move. In November, she bought a two-bedroom, one-bath in the Beekman Place area with windows on three sides, herringbone floors and a working fireplace for $840,000. Earlier this year, she and Kavi Ohri, 50, who works in the music industry, moved in and were married there. The neighborhood, an out-of-the-way enclave between First Avenue and the East River, meets her standard for quiet. “It’s almost like the land that time forgot,” she said. For some Brooklynites, the idea that they can afford a place in Manhattan is still a head spinner. 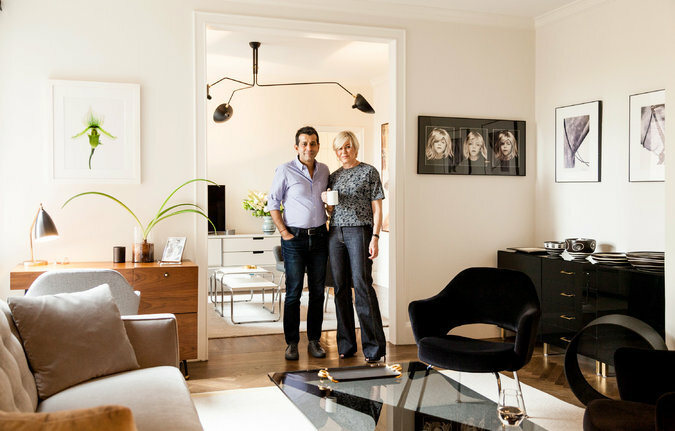 Christina Lewandowski and Eric Kabakoff in their new home in Carnegie Hill on the Upper East Side. They moved from Gowanus, Brooklyn. In March she listed her place for $585,000. It quickly went into contract for $615,000. “For nine and a half years that was a pretty good profit,” said Ms. Krantz, who is putting her proceeds toward a $650,000 studio in an elevator building on West 12th Street in Manhattan. While she is saying goodbye to outdoor space and a fireplace, Ms. Krantz will not miss the commute or the climb up three flights of stairs. “When I close, I will be able to walk to work,” she said. Renters are also finding Manhattan can sometimes offer better values than Brooklyn, where a steady stream of young professionals willing to pay ever more has helped push the median monthly rent to $2,893 in March. That is up more than 30 percent from the median of $2,200 five years ago, according to Miller Samuel. In Manhattan, the median rent was $3,395 in March. Development has also contributed to higher Brooklyn rents, as glass and steel high-rises have sprouted in Williamsburg, Greenpoint and Downtown. “With more and more neighborhood amenities and full-service living options coming to the Brooklyn waterfront, New Yorkers looking for high-end rentals are increasingly seeing Manhattan and Brooklyn on equal footing,” said Ashley Wirkus, the director of residential leasing for Two Trees Management Company, a real estate development firm based in Dumbo with developments in both Brooklyn and Manhattan. Some apartments in its Brooklyn portfolio now outpace Manhattan. A 967-square-foot two-bedroom, two-bath in Dumbo offering water views including three bridges and Lower Manhattan recently rented for $7,020 a month at 60 Water Street, a glassy tower with 232 market-rate apartments. A similarly sized two-bedroom, two-bath with Hudson River views rented for $6,050 a month on the western edge of Manhattan at Mercedes House, an 850-unit apartment complex at 550 West 54th Street. Both buildings were developed by Two Trees Management, though Mercedes House has more amenities, including a screening room and a high-end fitness club with sun decks, a spa and indoor and outdoor pools. There are lifestyle choices to consider when weighing trade-offs. Last June, Elena Garcia Diaz-Pines left a $2,100-a-month one-bedroom on the Upper East Side for a $2,480-a-month two-bedroom in Bushwick, Brooklyn, splitting the rent with her boyfriend, Sean O’Connell, 29, a motion graphic designer. The couple’s new apartment was slightly larger, but they soon discovered that for what they were paying, the apartment had a lot of minuses. “Thin walls, drafty windows, and a general feeling of being in the middle of nowhere for so much money,” said Ms. Diaz-Pines, who missed basic conveniences such as a nearby pharmacy. “All you have around you are delis and health food stores,” she said. So with their lease renewal approaching, the couple went back to the Upper East Side. Last month, with the help of Angel Dominguez, a saleswoman at Citi Habitats, they found a newly renovated one-bedroom in Yorkville for $2,395 a month. Recognizing an opportunity, at least one developer is hoping to lure current and potential Brooklynites to Manhattan with stylish accommodations like those that have proved so popular at the new Brooklyn towers. At 245 East 80th Street, a 110-unit building, A & E Real Estate Holdings is giving vacant apartments a serious makeover. Parquet floors are becoming white oak and dated kitchens are receiving upgraded appliances and finishes. Leasing is expected to begin in June. Rent is still being determined. The company that will handle leasing and marketing, aptsandlofts.com, is based in Brooklyn, and was hired for the project partly because of its experience in that borough, said its founder, David J. Maundrell III. “Basically, they reached out to us because they felt we have access to people who moved to Brooklyn and may want to move back to Manhattan,” Mr. Maundrell said. “The Upper East Side is a pocket of Manhattan where you can still get value compared to other places downtown in the city, and at times, in Brooklyn.